Set up forms for your clients to fill when submitting a booking request. Step 1 - Create a new form. 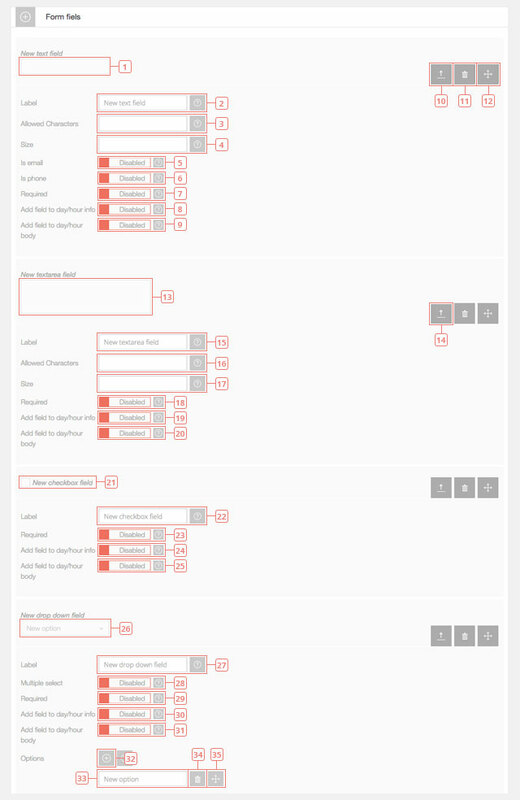 Step 2 - Select the form you want to edit. Step 3 - Change the name of the form. 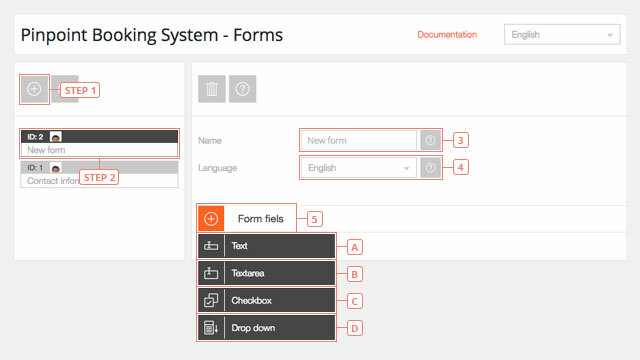 Step 4 - Change to the languages you want to edit the form. Item 1 - An example of a new Text form field. Only Text form fields can be used for emails or phones. Item 2 - Edit the Label. This will be visible to your clients. Item 3 - Set the allowed characters. Leave it blank if all characters are allowed. Item 4 - Set the number of characters allowed. Item 5 - Enable if the text field is an email address. Item 6 - Enable if the text field is a phone number. Item 7 - Enable if the text field is required. A required field will not allow your client to send a booking request without entering data in it. Item 8 - Enable to show the information submitted in the front-end calendar in the info box of the day/hour. Item 9 - Enable to show the information submitted in the body of the day/hour in the front-end calendar. Button 10 - Click to hide the settings for this form field. Button 11 - Click to delete this text field. Button 12 - Click to move this text field before or after another form field you create. Item 13 - An example for a new Textarea. Button 14 - Click to expand the settings for this form field. Item 15 - Edit the Label. This will be visible to your clients. Item 16 - Set the allowed characters. Leave it blank if all characters are allowed. Item 17 - Set the number of characters allowed. Item 18 - Enable if the text field is required. A required field will not allow your client to send a booking request without entering data in it. Item 19 - Enable to show the information submitted in the front-end calendar in the info box of the day/hour. Item 20 - Enable to show the information submitted in the body of the day/hour in the front-end calendar. Item 21 - An example for a new checkbox field. Item 22 - Edit the Label. This will be visible to your clients. Item 23 - Enable if the text field is required. A required field will not allow your client to send a booking request without entering data in it. Item 24 - Enable to show the information submitted in the front-end calendar in the info box of the day/hour. Item 25 - Enable to show the information submitted in the body of the day/hour in the front-end calendar. Item 26 - An example for a new dropdown field. Item 27 - Edit the Label. This will be visible to your clients. Item 28 - Enable if you want your clients to select more than one option from the dropdown field. Item 29 - Enable if the text field is required. A required field will not allow your client to send a booking request without entering data in it. Item 30 - Enable to show the information submitted in the front-end calendar in the info box of the day/hour. Item 31 - Enable to show the information submitted in the body of the day/hour in the front-end calendar. Button 32 - Click to add a new option to the dropdown field. Item 33 - Edit the option name. Button 34 - Click to delete the option. Item 35 - Click and drag to change the order of the options in the dropdown field.